Thinking about and comparing breakdown cover can be a daunting task, especially if you’ve never done it before. This essential part of driving has a huge number of factors that can come into play, meaning it’s important to consider every one of your options. Breakdown Cover Comparison allows you to compare deals from all the leading breakdown cover providers, making it quick and simple when shopping around. Whether you’re buying breakdown cover for the first time or shopping around for the latest deal, this guide will show you what to consider when comparing. When comparing breakdown cover, there’s a number of cover options to choose from. Choosing one or more of these allows you to see which providers offer them and at what price. You can choose any combination of cover options depending on your needs, so before you start, think carefully about what your priorities are when you’re driving. Roadside assistance is the most common type of breakdown cover, with every breakdown provider offering it. This entitles you to have your car looked at on the road, and if the car can’t be fixed, it’ll be towed to the nearest garage. National recovery allows your car to be towed to a destination of your choice, giving you a bit more freedom at an increased price. Home start means you can get your car fixed if you break down at home and onward travel gives you travel options if your vehicle is not fixable. Those who drive frequently in Europe can also choose European cover, which allows for roadside assistance and recovery when in Europe. You should consider all these options when you’re comparing breakdown cover, as chances are many of them will apply to you when you’re buying. Breakdown Cover Comparison allows you to compare and contrast all of these options. As well as options, there are plenty of breakdown cover providers to choose from. These range from big names such as Green Flag and RAC to smaller providers like GEM and QDOS. Which one you choose will depend on a number of things, like the type of cover you need and how much you’re willing to spend. 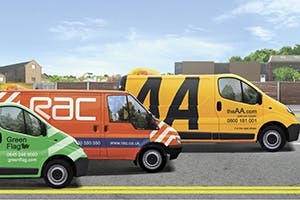 RAC, The AA and Green Flag are very much the most popular breakdown cover providers, largely thanks to the reliable and comprehensive cover. Choosing either of these three ensures you’ll get the very best service no matter what options you require. Providers such as GEM and Drive 24-7 are lesser known but have good reputations all the same along with very reasonable prices. Using Breakdown Cover Comparison, you’ll be able to find the sort of cover you’re after on all available providers and compare the prices. Whilst many people looking for breakdown cover will only be interested in covering one vehicle, most providers also offer family cover, meaning you can cover members of your family rather than individual vehicles. This is an important thing to consider when buying breakdown cover and is usually something you can compare with all providers. Family cover can often save you a lot of money if you’re looking to cover your whole family rather than just yourself, so keep it in your mind when you’re comparing. Where you drive is another important aspect of buying breakdown cover. If you drive your vehicle exclusively in the UK, you won't need to worry about this, but if you take your car away with you in Europe frequently, it’s best to consider European cover when comparing. Most modern providers now offer European cover, which ensures that you’ll be covered when driving in Europe. Most providers offer both Euro Cover and Short-Term Euro Cover, so you can get covered even when you briefly travel for holidays or business trips. Providers such as Green Flag offer comprehensive and fast European cover, with 24/7 English-speaking support and roadside assistance. Once you’ve weighed up all your options and compared the providers available, it’s time to get a quote. Using Breakdown Cover Comparison allows you to get one instantly just by clicking the ‘Get Quote’ button, which will give you a great idea of how much your cover will cost. From there, you can either go with the quote you’ve been given or shop around some more for a different deal. With Breakdown Cover Comparison, we’ll always aim to provide the most up to date prices available. This content is an independently written by Breakdown Cover Comparison. Breakdown Cover Comparison are not paid to write this content but receive commission for any sales they make from it. What's the difference between personal and vehicle cover? We help you decide which kind of breakdown policy you should opt for. A guide to some of the UK's best known car breakdown cover providers. Check out our guide to types and levels of breakdown cover for more information on what could be best for you.